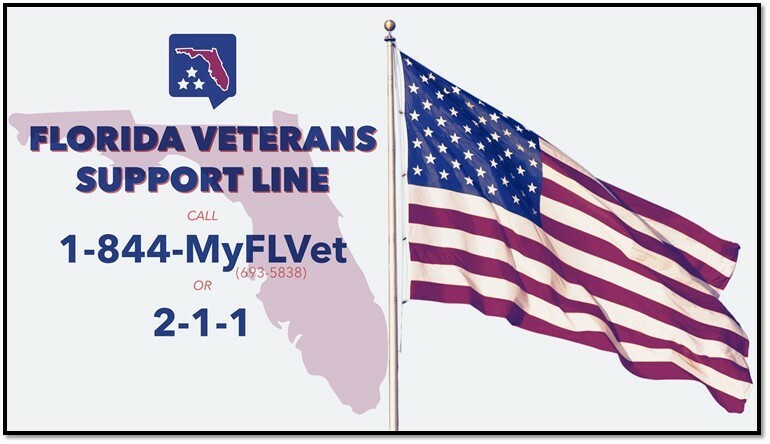 TAMPA – With a veteran population of more than 1.5 million in Florida, Crisis Center of Tampa Bay is pleased to announce the Florida Veterans Support Line, 1-844-MyFLVet, has expanded to every county in Florida. Florida has the third largest veteran population in the nation. Through a simple phone call to 1-844-MyFLVet, Florida veterans who are struggling with issues like PTSD, substance abuse, relationship troubles and personal finances can connect confidentially to emotional support and community resources, 24 hours a day. As part of the statewide expansion of the Florida Veterans Support Line, the Crisis Center of Tampa Bay created a revolutionary billboard appearing near MacDill Air Force Base in Tampa. “Stitches of Duty” was stitched entirely of actual military gear donated by veterans. Watch the complete story here. When a veteran calls 1-844-MyFLVet, they will speak with someone who is trained to provide immediate emotional support. Calls are answered by a network of local, non-profit organizations throughout the state, including those that also answer calls for the 2-1-1 system in Florida. Veterans can also be referred to both VA and non-VA resources, including non-profit organizations, community programs and local government services. Help is available regardless of discharge status. A list of the organizations answering calls to the Florida Veterans Support Line can be found at: https://flvetsupportline.squarespace.com/about. “We are proud to have piloted the Florida Veterans Support Line in Tampa Bay, and now, based on the statewide need and positive impact of this service on our veteran community, we are thrilled to expand the resource statewide. Thanks to funding by the Florida Department of Veterans’ Affairs, we will be able to more broadly serve those who have so bravely served our country,” said Clara Reynolds, President & CEO of Crisis Center of Tampa Bay. “We pride ourselves on being the most veteran-friendly state through our support of the more than 1.5 million veterans that reside in Florida. We are honored to support this initiative as part of our goal to ensure Florida veterans receive their earned services, benefits and support,” said Steve Murray, communications director of the Florida Department of Veterans’ Affairs. For more information about the Florida Veterans Support Line, visit www.MyFLVet.com.